There is one genre of painting that I have become quite renowned for and that is night paintings. 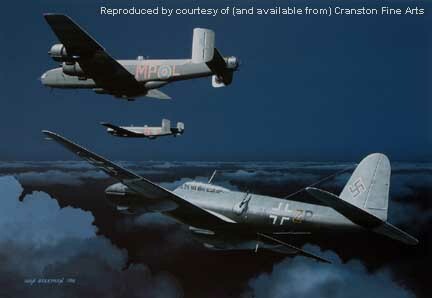 As an aviation artist, it is frequently necessary to depict an event or action that took place between dusk and dawn and it creates all sorts of challenges for the artist. The main challenge is to produce a picture where the main object is clearly defined, yet not so much that the scene takes on the appearance merely of low daylight. Of course, all the same rules for painting apply, but everything must be more muted, possessing less contrast and perhaps just a little ethereal. When painting aircraft at night (some examples of which appear here), moonlight is sometimes the artist's only source of illumination. However, if flak or fire is present to make the scene more dramatic, these too can be utilised to throw light onto the main subject, sometimes from several different angles. 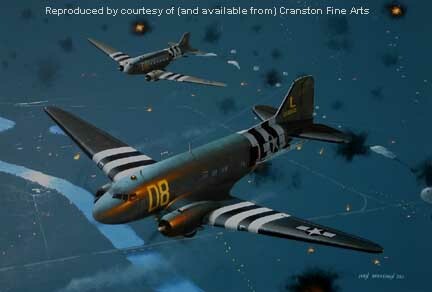 This is perhaps best illustrated in my painting Hell Below Us, which shows American C-47 transports dropping paratroops over Normandy on the night of 5th-6th June 1944. Before starting work on this painting, I had first to make sure that there was indeed a moon that night and research soon confirmed that there was - in fact D-Day had been planned around the full moon and associated tides. So I had my main source of light with which I created a slightly hazy backdrop, the moon only appearing as a reflection in the river far below. Not wishing to overdo the flak bursts around the aircraft, I opted for puffs of smoke and the single bright reflection on the fuselage side of a nearby flash from an exploding flak shell. 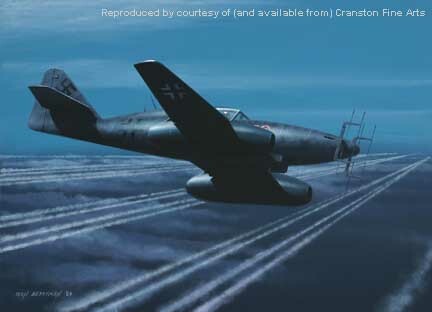 All these elements enabled me to set the aircraft as virtual silhouettes with the gentle moonlight striking the far side of the fuselage, along the wings with the flak burst creating an orange highlight on the nearside. The use of blues for all the moonlit elements and orange for the flak adds drama to the painting. Clearly, it is a night scene, but most details can still be defined. When Nelson's flagship Vanguard got into difficulties in a severe storm off Toulon in 1798, almost all sail was taken in and the ship was thrown around violently in the huge swells and gusting winds. 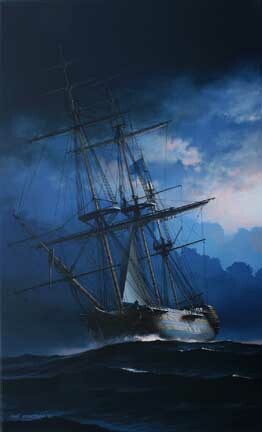 When I painted this dramatic scene, I chose to light the subject by spreading the moonlight across the canvas by lighting the storm clouds, creating a luminous backdrop against which to set the ship's empty masts and yards. The tilt of the ship allowed me to light her wet wooden hull just enough to give the ship form and shape. Much of this painting is in silhouette, even the heaving sea being left quite simple in order to focus attention on the foundering Vanguard. Under Bare Poles is one of my favourite creations, the title referring to the naval term for a ship devoid of sail. Since I have now owned up to painting under another name in my first blog on this website, it would be fitting to include something of 'human' form in this feature. Painting under the name of Heller, I produced a series of moonlit fairy paintings that proved very popular. Moonlit Fairy (I never did come up with a better title for it! ), shows how the curves and muscles of the figure can be beautifully enhanced as a night scene, especially when gossamer-thin wings are added to give form to the shadowed side of the body. I am sure that, without the wings, this painting would have been too dark and too abstract. 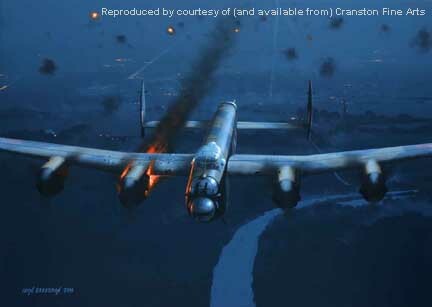 Keen eyes might note that I even added 'lens flare' to this illustration for realism. Art masquerading as photography - now there's a reversal! Old Father Thames could be a night scene or it could simply be a depiction of the Victorian Thames caught in a classic London smog. I'll leave that up to the viewer, but it is worth including here because, although the colouring is totally different and much, much warmer, the principles remain the same in the techniques used. The important thing to remember is that moonlight robs the eye of colour. Take a walk away from street lighting under a full moon and you will find it an eerie and disorientating experience. Objects are less distinct and colours all but disappear. Many may think that robbing an artist of these essential tools would make his or her job impossible, but I believe that it opens up many new possibilities and has led to some of the most dramatic and evocative paintings I have ever done.